Free Shipping Included! 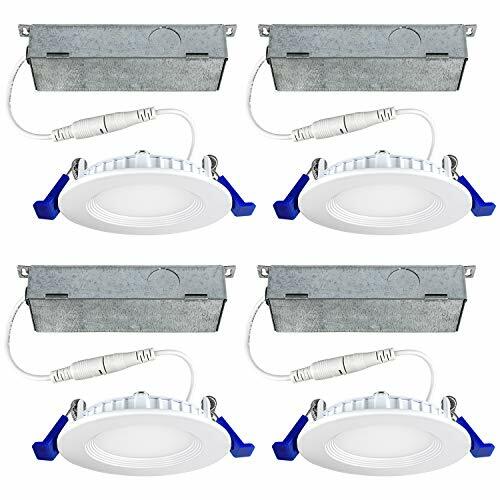 3 Inch Ultra Thin LED Recessed Ceiling Light with Junction Box, Luxrite, 7W, 5000K (Bright White), 450 Lumens, Dimmable, Low Profile Recessed Downlight, ETL & IC Rated (4 Pack) by Luxrite at Defy Now. MPN: LR23696. Hurry! Limited time offer. Offer valid only while supplies last. SLIM DESIGN - A ultra thin, low profile retrofit downlight that is a space saving solution to narrow ceilings that only allow for a couple inches of space. EASY INSTALL- Each 3" recessed LED light is designed for a quick install and does not require any recessed cans. An all-in-one design that includes a junction box for simple wiring, a plug and twist connection to the LED downlight, and spring-loaded clips for a flush to ceiling finish. DIMMABLE - Take control of your lighting needs with the ability to reduce from 100% to 5% lighting output with a fully dimmable 3in LED recessed lighting fixture. Set your lights according to your mood and take delight in a pleasant atmosphere, every time. INSTANT SAVINGS - Reduce your electricity usage with an thin LED recessed light kit that only used 7W of power, effectively cutting the cost of your monthly electricity bill! A flawless replacement to your standard recessed ceiling light. RELIABLE LIGHTING - Built with an astounding 50,000 hours of lifetime which means no replacement for your LED ultra thin downlight will be needed for the next 45 Years. Comes ETL Listed and IC rated for your safety, and backed by a 3 Year warranty, making it the ideal choice for your kitchen, bathroom, bedroom, office, or home remodel.